An unaltered photocopy of your DD-214, WD AGO, NAVPERS, NG or other military issued document clearly displaying your Air Force Achievement Medal authorization. The Air Force Achievement Medal was established on October 12, 1980, by Secretary of the Air Force Hans M. Mark. The Air Force Achievement Medal has been in effect since October 12, 1980. 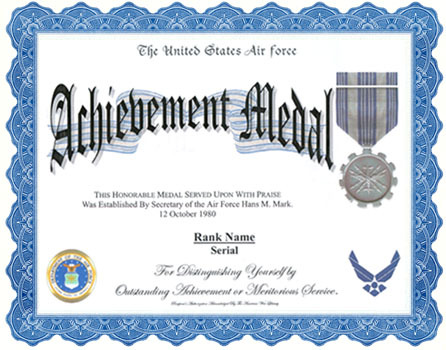 The Air Force Achievement Medal is worn after the Joint Service Achievement Medal and before the Presidential Unit Citation. Additional awards of the Air Force Achievement Medal are denoted by oak leaf clusters. 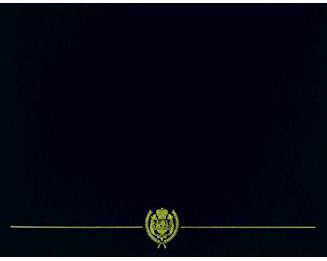 Effective January 11, 1996 the bronze V device may be worn on Achievement Medals awarded for heroic actions that do not qualify for a Commendation Medal (with V device) provided the action occurs during a contingency operation that the Joint Chiefs of Staff has declared as a "hostile environment." Single heroic acts during terrorists acts and isolated combat incidents may also qualify, but the device may not be authorized for heroic acts that take place during peacetime. The Air Force Achievement Medal was designed by Captain Robert C. Bonn, USAF, and sculpted by Donald Borja of the Army's Institute of Heraldry. The first recipient of the Air Force Achievement Medal was A1C Heidi M. Uttrich, who received her medal in 1981. The medal is a silver colored nebular-shaped disc one and three-eighths inches in diameter with an oxidized satin finish. The central portion of the medal is recessed and contains in its center a heraldic thunderbolt similar to that used on the shield of the Air Force Seal. Forming a circle around the center of the medal and just inside the nebular border, the inscription in raised letters, AIR FORCE MERITORIOUS ACHIEVEMENT. The center of the medal is blank for engraving the recipient's name. The ribbon to the Air Force Achievement Medal was designed by MSgt. William B. Dowling and Mr. Ruben Cortinas of the Air Force Military Personnel Center (Recognition Programs Branch) and consists of three sets of four vertical stripes of ultramarine blue over a silver-gray background. The colors have no meaning except to give the medal a distinctive appearance.